“Necessity is the mother of invention.” That phrase rang unusually true for me this past week. 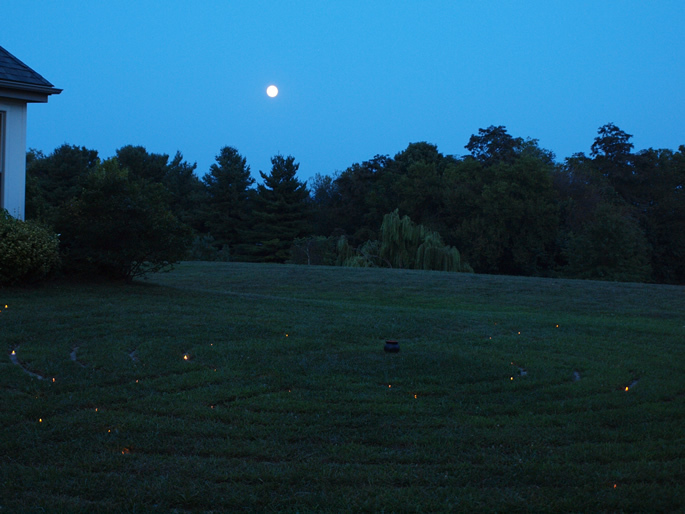 I facilitate monthly Full Moon Labyrinth walks at the Unitarian Universalist Congregation of Frederick. We’d been using a borrowed canvas Labyrinth for our indoor walks. It was suddenly called home to its owner (for use in her church) three days before a scheduled Labyrinth walk. It became necessary to find a suitable substitute on very short notice. Thanks to my mother, sister and sister’s-boyfriend, we managed to work a minor miracle and now have a lovely Classical Labyrinth for use at the church. It cost slightly less than $200 in supplies and took my family and I 4 hours to make, start to finish. Here’s how to make one. *6 9′ x 12′ canvas drop cloths. I paid $21.98 each. Make sure the canvases all match in color. Different brands may have a variation in hue. *Colored duct tape. This part is a little tricky. I created a rainbow Labyrinth. Each circuit is marked out with a different color of tape. If you choose to go that route, you will need 40 yards (2 20 yard rolls) for the three outermost circuits. Each circuit thereafter will only need one 20 yard roll. So, for mine, I had: 2 black, 2 red, 2 orange, 1 yellow, 1 green, 1 blue, 1 purple, 1 silver, all in 20 yard quantities. 20 yard rolls cost $3.57 each. If you’re using all one color, you will probably need about 120 yards or 6 rolls. Save your receipts in case you need to return any unused tape. *some friends! This goes a lot faster with a little help. Graph out your design. This will help you keep track later on, as well as explain to any helpers what you’re trying to accomplish. In this graph, the canvases are in purple ink, the circuits in pencil, and one square = 1 foot. Step 2: Lay out your canvases on the floor, ‘wrong’ side up. Like sheets, the canvases will have visible seams and tags on one side. Put that side facing up in the layout your Labyrinth will take. Step 3: Using the white duct tape, tape the edges of the canvases together. Because these are painter’s drop cloths, the canvases aren’t cut perfectly. The outermost edges of your finished Labyrinth won’t be perfect. You can always trim them later if it makes a big difference to you 😉 I began by taping the long, center seam of the canvases, then working out from there. Step 4: Carefully (this is where having extra hands can help) turn your now-one-whole-piece canvas over. The ‘right’ side will now be facing up. Using the white duct tape, tape the edges of the canvas together. This reinforces the seams and smooths over any uneven edges. Step 5: Using your chalk and tape measure, mark your circuit spaces from the outside edge in. In this design, the circuits are 15″ wide. So, starting a couple inches from the outside edge at the top of the canvas and both sides, mark a line every 15″. You’ll have eight marks (for the seven circuits) on each side. Step 6: Measure the center space from edge to edge to find the exact center point. Using your yarn, make a rough compass by taping (or having your helper hold) one end at the exact center. Attach your chalk to the other end right above one of your marks. Run a chalk line from center mark to center mark using your rough compass. It will make a circle. Step 7: Using your tape measure (or tape measures if you’re having helpers assist), mark out the rest of the circuits in chalk. Mark them out a little over 1/2 of the way around to the center bottom of the design. Leave that space blank so you can mark in the turning points. Step 8: Draw in your center cross, L-shapes and dots, remembering to leave 15″ space on all parts of the path. Step 9: Connect the circuits to your center cross, finishing off the design. Walk the Labyrinth to be sure everything got connected correctly. Step 10: Duct tape over your lines in the color pattern you’ve chosen. It’s great to have help for this part! 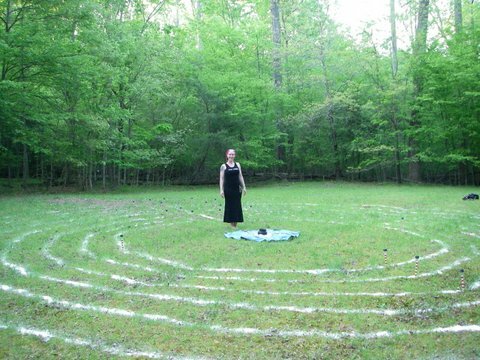 Step 11: Walk/dance/run your Labyrinth in joyous celebration! Step 12: Fold/roll your Labyrinth up. Canvas Labyrinths are very sensitive to soot and moisture. Make sure to store it in a waterproof plastic bin and to remind folks not to wear shoes on it during walks. Only use your canvas Labyrinth indoors. 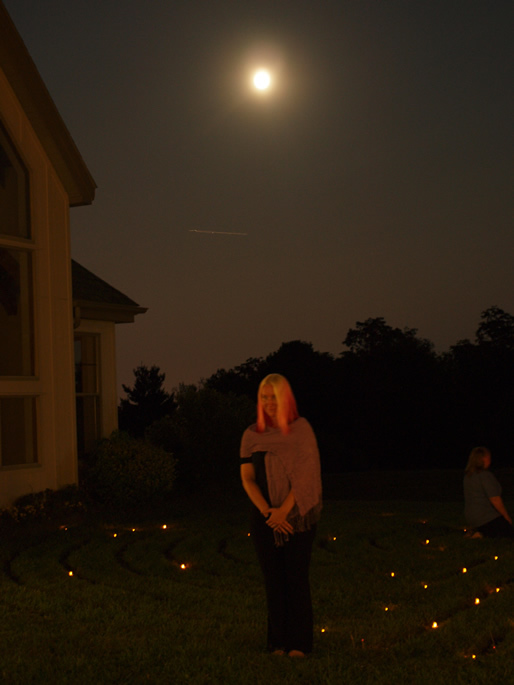 Here’s the finished Labyrinth at a Full Moon Labyrinth Walk, photo courtesy of Elisa. The lights are little flickering LED tealights we place on the Labyrinth during a Walk–they’re not actually attached to the canvas. Ta da! Not as sturdy and flawless as a canvas made from heavy-grade sailcloth, but still quite usable and resilient. This one comfortably fit 5 walkers at a time. 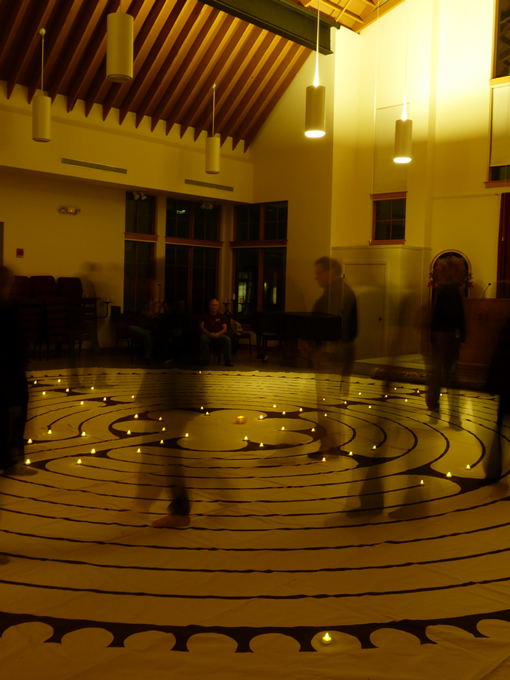 Last night, I facilitated an indoor Dark Moon Labyrinth Walk at the UUCF. Indoor walks are beautiful in a different way than outdoor ones. The environment is more controlled–the temperature is even, the light consistent, there are fewer distractions. The sanctuary where we roll out the canvas Chartres Labyrinth is acoustically bouncy, so the music we play is very haunting and echo-y in the stillness. Indoor walks there are a bit like falling into a pool of peace and stillness. Yesterday’s walk was particularly interesting for me due to the transition in my state of mind over the course of the evening. You see, I arrived angry. Furious, actually. I have pretty decent control over what shows and what doesn’t, so I don’t think anyone helping set up noticed. But inside, I was one enraged, roiling pot of flames and fury. 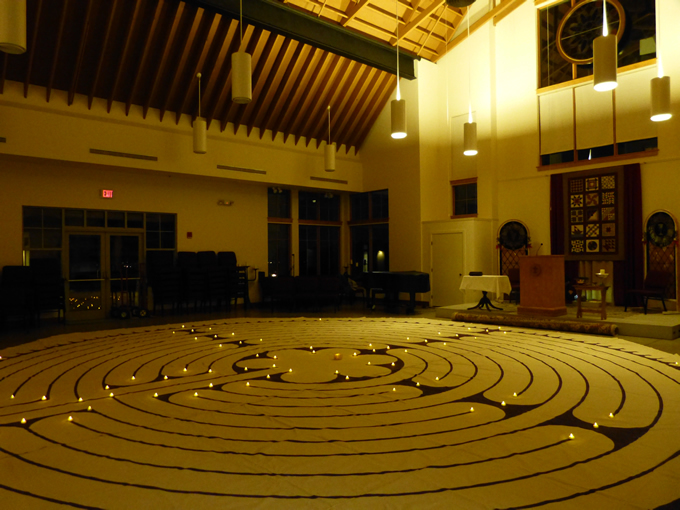 Some wonderful folks helped to pull the chairs to the borders of the sanctuary and we rolled out the Labyrinth. I put on my prayer shawl and stood at the entrance to the Labyrinth to welcome people to their walk. 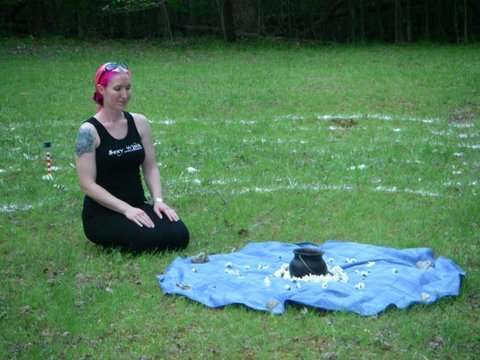 You see, I was concentrating on putting out the right energy for a Labyrinth walk. I wasn’t really thinking about my anger. It was just sitting there in the back of my mind, simmering away. But as people entered the pattern and began to walk, the flames went down. As I stood there, my back to the flickering tealights, purple Labyrinth and walkers, the pieces of the day I was so angry about turned around inside my head, showing how different they looked from another perspective. Showing how my point of view had gotten in the way. How my jump to anger had then made it impossible for me to listen, or to see things from a different vantage. How holding to rage silenced compassion. All the anger I was carrying fell away like so many stones tumbling down a hill. I almost laughed at one point. I hadn’t even *walked* the Labyrinth yet! The effect of a Labyrinth on me is, at this point, so strong that I can’t even stand near one without the quiet energy of that Sigil going to work on the inside of my head. By about 10 minutes into the walk, I was balanced again, if feeling a bit rueful about the mistakes I made during the day. One of the gentlemen attending the walk was gracious enough to take over my post at the entrance of the Labyrinth so I could walk as well. As I did, I focused on releasing all the blocks that tripped me up that day. Judgement. Single-mindedness. A lack of compassion. Not listening. Anger. The temper that used to get me into barfights is obviously still present, just changed in form. Something else to work on as I walk this winding path. And good to know–I had been pretending that I’m better with my anger now since I don’t hit people anymore. Granted, the symptoms are less severe, but the root cause is definitely still there. I carried the peace of the Center with me as I walked back out of the Labyrinth. I gently touched the shoulder of the man who had taken over as Guardian for me to thank him for my opportunity to walk. He emerged, startled, from a deep place. I hadn’t realized how far he’d gone within–in retrospect, I should have brought him out more gently. Anyway. I thanked him for the opportunity to walk. He thanked me as well, saying he hadn’t realized how cool it was to stand at the entrance of a Labyrinth as facilitator. I realized he was right about that. It’s a different way of experiencing the energy of a walk. But still potent. After all, my own proximity to other walkers, to the Labyrinth, was what brought me back down so I could actually see what went wrong earlier in the day. The Labyrinth met me angry. The Labyrinth gave me peace. We all hugged and bid each other safe travels we left. The web, you see. I apologized when I got home.